With our new Only in Ontario feature, we’ll be taking a look at some of this province’s best edible adventures, Canadian Signature Experience members and Feast ON designees. Our first selection, Johnston’s Cranberry Marsh, just happens to be all three. In the heart of Bala – the Cranberry Capital of Ontario, the Johnston family offers visitors a wide selection of experiences centered around the tart fruit. The farm has been in the family since the 1950s. The Johnstons are some of the province’s agritourism pioneers, having made their first foray into the market with wagon rides around the farm in the eighties. As interest grew, so did the farm. The family made the decision to open on a year-round basis and added a winery in 2001, leading to the creation of their signature product, cranberry wine. With decades of experience in the agritourism industry, the Johnstons have learned what works and doesn’t work for their business the good ol’ fashioned way – through trial and error and gradual expansion. When the wagon rides, which were designed to accommodate 50+ passengers, became difficult to schedule and run on a consistent basis, the family developed interpretative signage and trails to relay information to the consumer. Responding to the growth of food tourism, a patio was added where guests could linger longer, enjoying Ontario cheese plates with their wine. 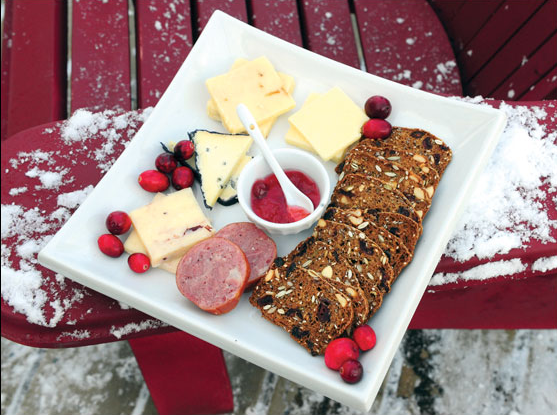 The artisanal offerings include cranberry preserves and a selection of Ontario cheeses. Photo credit: Muskoka Magazine. Today, visitors are invited to immerse themselves in all things cranberry. On the aptly named “Bog to Bottle Tour”, guests are escorted around the farm, where they can stand amongst the cranberry vines, tour the packaging facilities and learn potentially life-changing facts such as: cranberries don’t actually grow in water (they are only harvested there). To celebrate guests’ newly minted statuses as cranberry connoisseurs, the tour concludes with a tutored wine tasting. Photo ops abound in the cranberry bog. Photo credit: Johnston’s Cranberry Marsh Facebook page. The Johnston family is an Ontario agritourism success story, but true to form, they’re not resting on their laurels. Early adopters of social media, they’re always exploring new online marketing initiatives and are also hard at work developing a new blueberry experience. For Ontario’s unofficial First Family of Cranberry, the tart business has proven to be quite sweet indeed. Find the Johnston family on Facebook, Twitter and Instagram.